2 acres & yurt. 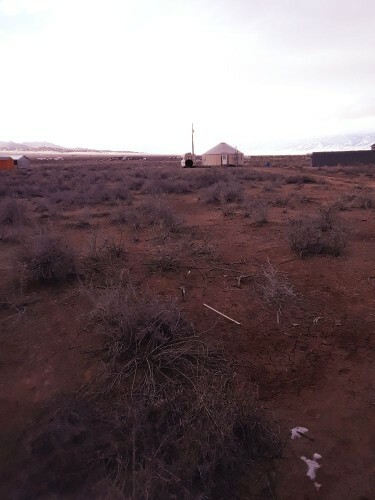 One acre with a 730sqft yurt and one adjacent undeveloped acre in Moffat, CO. One water spicket located outside behind the yurt. Water is through the HOA and is payed for yearly in addition to HOA dues. Indoor plumbing has not been put in, but a composting toilet has been installed (and no it doesn’t smell). There is no bath or shower, but the hot springs are five minutes away. They have membership discounts for residents that include use of the hot springs, sauna, and showers. 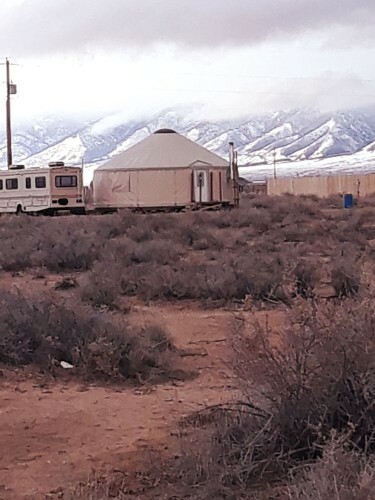 The yurt has electricity through SLVREC. Wood stove is the heating source. Internet is available through satellite. The yurt has vinyl flooring with spare pieces available. The shipping container in the pictures will not be available, but Healdworks rents and sells them. Driveway is mainly rock/gravel and located on a dirt road. Mailbox is located on main paved road. School bus stops at the end of the street a couple hundred feet away. The yurt is almost two years old and was purchased through Rainier Yurts. It is the Raven model with an added high winds package. It has a south facing door and four roll up windows facing southwest, southeast, northwest, and northeast. There is plenty of room for building a loft. Great place to have a greenhouse since it is so sunny most of the time. Small portable washing machine, mini refrigerator, sink basin, large camp stove, and old couch can all be included if you want. Bathroom walls are being completed. HOA includes stocked community pond, use of HOA clubhouse, and RV dumpsite. HOA rules are not strict (lots of freedom). This can be lived in year round. It would also make a great hunting cabin since BLM land is very close by. We have seen elk and pronghorn in the area pretty regularly. Great area for outdoor enthusiasts! The Great Sand dunes national park is nearby along with Baca wetlands and Mt. BLANCA. The town of Salida is popular for trout fishing and rafting. The closest school is in the town of Moffat, and the nearest university is Adam’s State University in Alamosa about a 50 minute drive south. CSU has a small branch in the town of Salida about a 45 minute drive north. Hospitals are in Salida and Alamosa. I’m interested in this! Also I have several questions. What are the hot springs located nearby? What are the HOA dues/restrictions? How long have you lived there and why are you leaving? How many people live in the immediate area? Am I able to have chickens and a goal or 2 if I want?